The CSE-PPT (Professional and Subprofessional levels) for the year 2018 is scheduled to take place on March 18, 2018 and August 12, 2018 in NCR, CAR, CARAGA, ARMM and all Regional testing centers nationwide. CSE-PPT aims to establish a Register of Eligibles (RoE) from which certification and appointment to first and second level positions in the civil service, except those involving practice of profession and/or are covered by special laws, provided the eligibles meet the qualifications and other requirements of the positions. CSE-PPT examinees will be informed of their school/room assignments through the ONSA which can be accessed at CSC official website. Should the examinee can't access the room assignment, he/she can directly verify with the concerned CSC Regional or Field Office, contact numbers are posted above. Examinees shall bring the following requirements on examination proper. Valid Identification Card - preferable same ID presented during filing of exams, if no valid ID, bring original PSA-issued birth certificate; Notice of School Assignment generated thru ONSA, Application Receipt (if applicable); black ballpen, water or non-alcoholic beverage placed in transparent container. In preparation for the upcoming exam, examinees are advised to visit the assigned school/testing venue before the examination day to be familiar with the location. On the exam proper, CSC reminds examinees to report earlier at the testing venue. Testing centers will be open starting 6:00 A.M. Gates of testing venues shall be closed at 7:30 A.M. Likewise, late comers will not be admitted. Cellular phones or similar gadgets, calculators, wristwatches, books and other forms of printed materials are not allowed inside the examination premises. Examinees shall adhere to the attire set by the Civil Service Commission. Proper attire is advised to be worn on the day of exams. Wearing of slippers, short pants, sleeveless shirt and blouse, or similar clothes are not allowed. 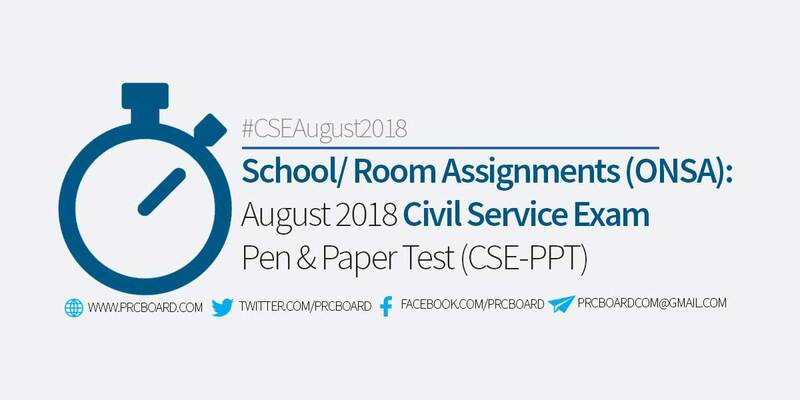 To receive regular updates about August 2018 Civil Service Exam (CSE )results as well as other related announcements, you may refer to CSC official website or follow us at our social media accounts via Facebook and Twitter. May i know my room and school assignment on Aug 12, 2018 examination. Thank You! may i know my room and school assignment on August 12,2018? Thank you! May I know my room and school assignment on August 12,2018? May i know my room assignment? on aug.12 exam? Do we already have room assignment for NCR CSC Examinees? Thanks. Good morning, may I know my room assignment, on August 12? Region 7. May I know my room assignment? May i know my room assignment?? Hi. May I know my School Assignment on August 12, 2018? Im from NCR. Thank you. Hi, may i know my room assignment from NCR. hi may i know my room / school assignment on august 12 2018? im from ncr. Hi may i know the room assignment for NCR on Aug. 12, 2018? I have a concern lang po regards to my middle initial info,kasi po ang nkalagay senyo Ilagan Maricar N.. which is its M po. Magpantay. Salamat po. I hope machange nyo po agad. Thanks. Hi Electrical Engineering graduate po ako . Tanong ko lang po kung allowed pa po ba yung fx-911ES plus ngayong darating na board exam namin. Good evening, may I know my school and room assignment for August 12,2018.? In Bohol. May i know too my school assignment and room no.? Hi! May Iknow my room and school assignment on Aug 12, 2018? sir madam...may i know my room assignment region 12 po..
Hi good day! May Iknow my room and school assignment on Aug 12, 2018? Hi! May I know the school and room assignment in NCR on August 12? Thank you. Hi may I know my room assignment ARMM? Tuloy po ba ang exam tom?? ?